What great visual impact from a simple idea. Kudos to you for trying all those quilting motifs. I hope you'll show us this when it's done and washed, as I'm also curious about how the different designs look. This is a fabulous way to start 2018! I like that you broke up the motifs every other row, Leanne. That's a great idea. 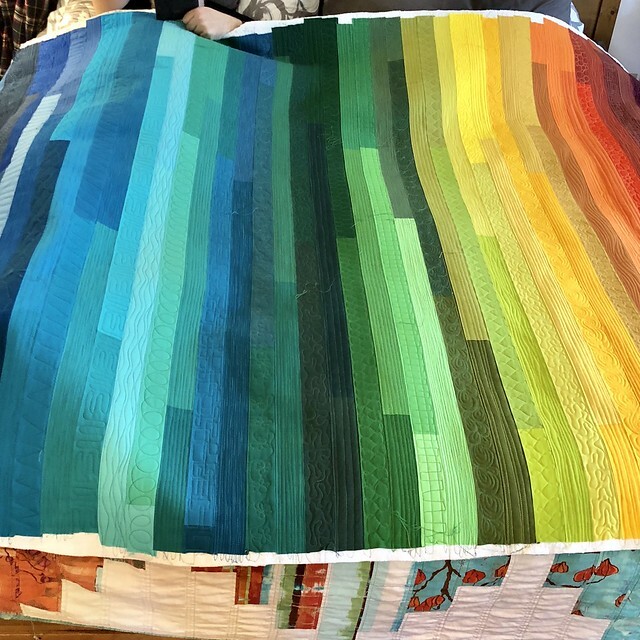 The quilt is really colorful and my husband and I would likely rotate it around the bed to get to see it from different angles. I love this quilt and the quilting you did in it! I am sure washing and drying will change the texture, unless you used a poly batting. I really love the different motifs and it is such a fun way to experiment with ones you love and ones that don’t love you! Wow! This quilt is so alive with color and texture! You must be so proud of this. Even though it's perfect now, I'd be curious to see how washing it will improve it. Great work! This is really stunning! I love how unique you've made it with your quilting! I love how this turned out! It's so fun to make a "machine quilting sampler" like this!! 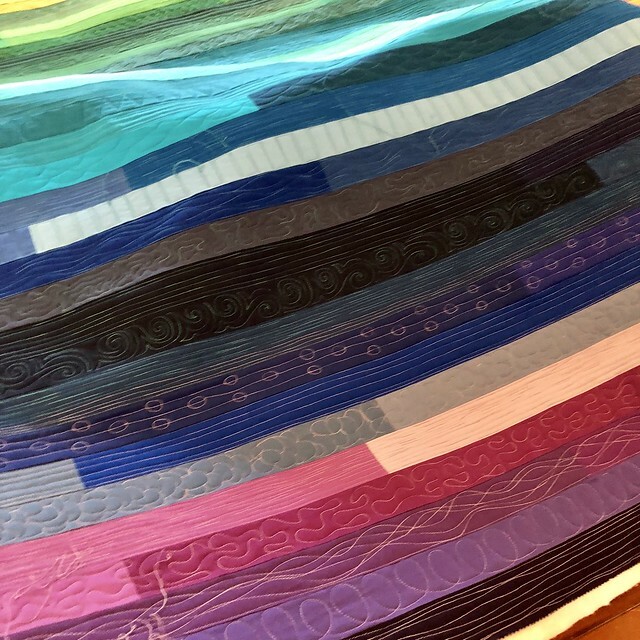 It's wonderful to see how a very easy quilt to make can be visually stunning, as well as using up fabrics which may have been languishing many years. Happy new year! It's stunning! 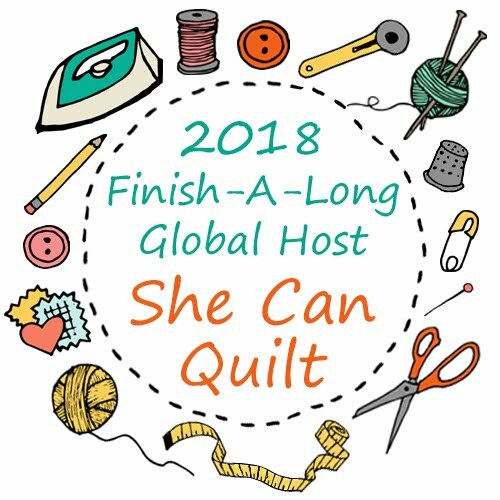 This is making me want to actually master some FMQ patterns in 2018! Love it! What a great idea. I have to read back to see if you mention thread color and backing. 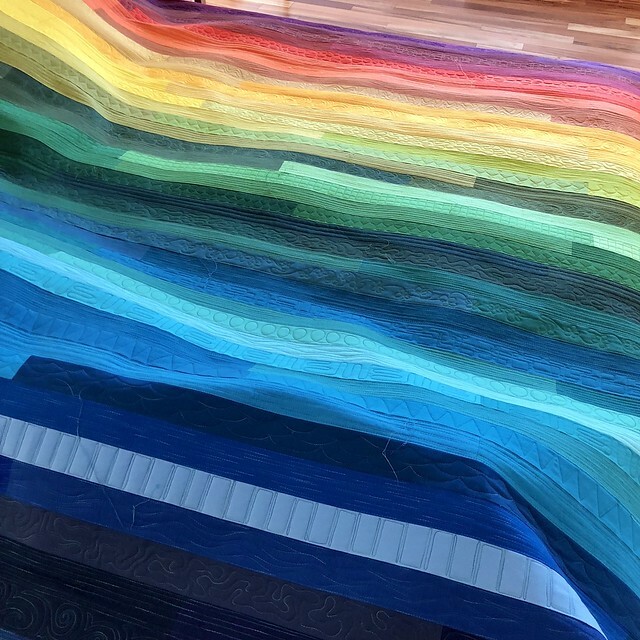 Oh my goodness, that quilt is stunning! 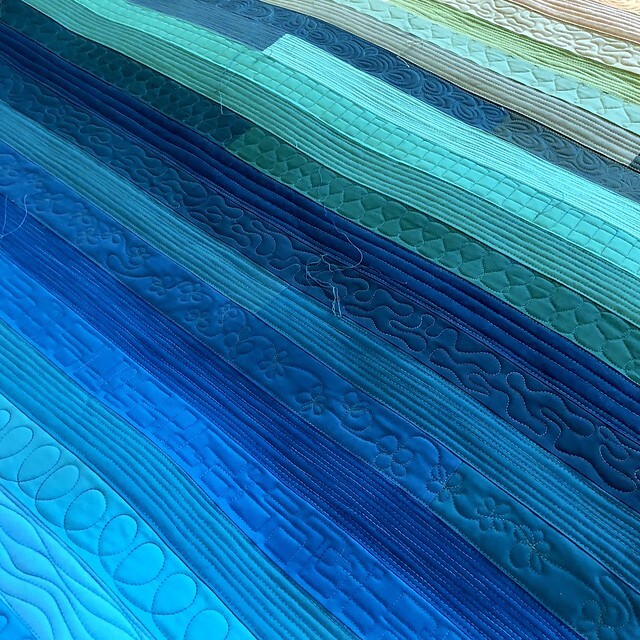 And beyond the "mere" use of color, all those different quilting motifs really pop. It's so happy looking! Wow! This is wonderful. 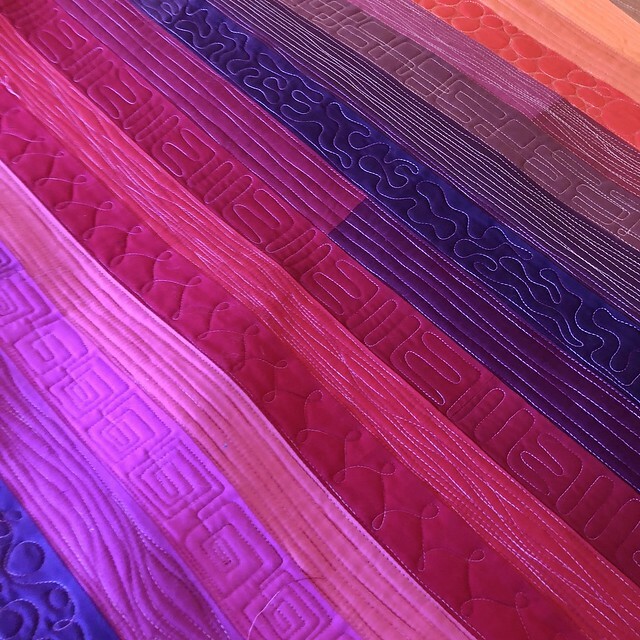 I love the variety of colors, and the quilting is marvelous. Thanks for sharing! What a beautiful quilt and what a brilliant idea for the quilting. Rainbow colors are always very appealing for me. Thanks for sharing. It's a beauty! I love it. 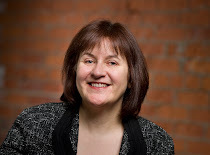 Happy New Year, Leanne. 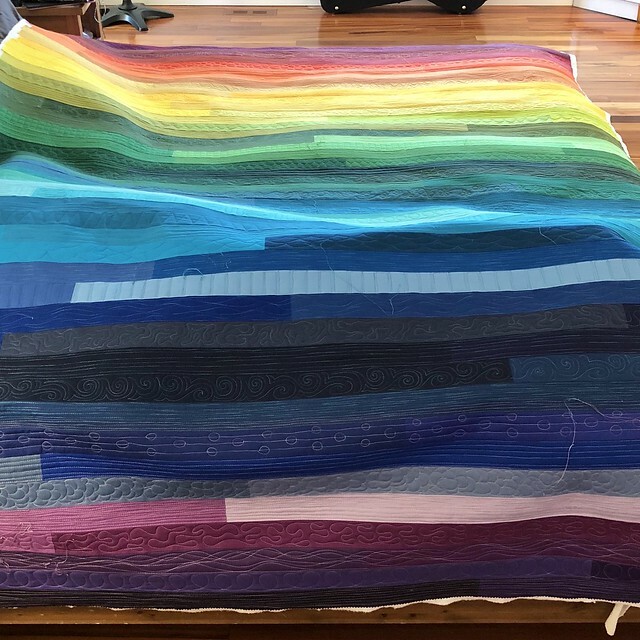 Its a gorgeous quilt! This is a wonderful idea! The colors are beautiful and I love the way you used various quilting patterns to give it such interest! I may have to borrow this idea! It turned out beautiful. It is very striking. Thanks for sharing your process too. This is so colourful. 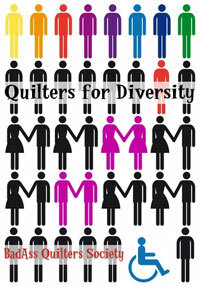 I like the idea of different quilting motifs in each row. It's a wonderful (almost) finish. Oh wow! I LOVE this! What a stunner! I was wondering if you would still need three jelly rolls to make a queen size quilt? Your creativity is really showing in this quilt, a true statement to your bright and giving character. Wonderful job. The colours in this quilt look positively electrified. I like how it looks in you photos. The quilting details to are amazing. 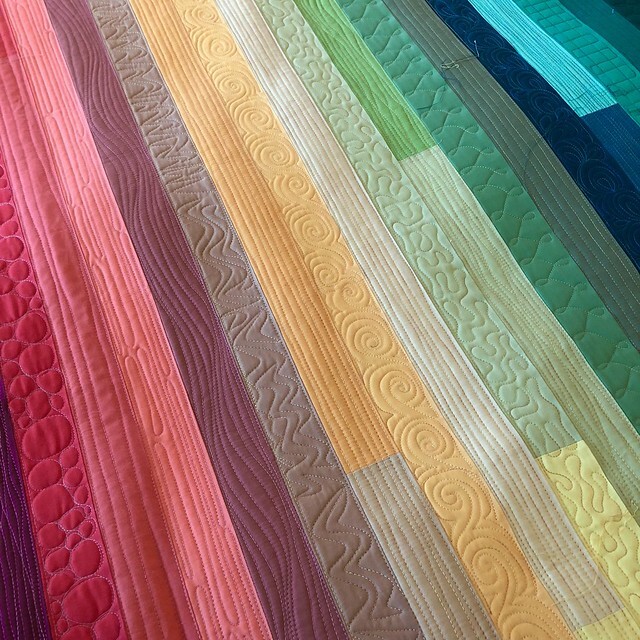 The use of jelly roll strips for this quilt is perfect. The colors a almost electric. What makes it so amazing is the quilting. Your dedication to quilting each row is inspiring. I have a feeling it's gonna wash up just fine...amazing actually! I like that you used it to work on different designs. It makes it special. 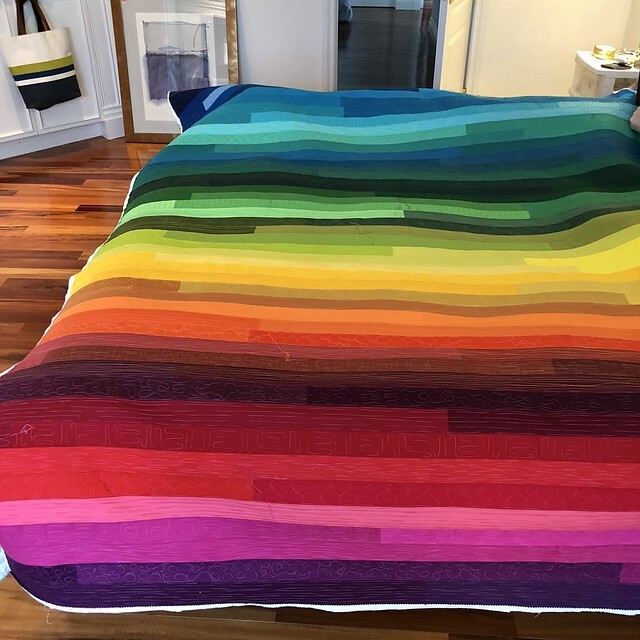 Oh my gosh, I love this quilt! What a great idea to switch up the quilting on each stripe! I may have to try this. Love the colors especially. I love it! The simple patchwork looks so great and the quilting idea is really inspiring. A work of art. It's amazing! I love all those colors and the quilting looks fabulous. 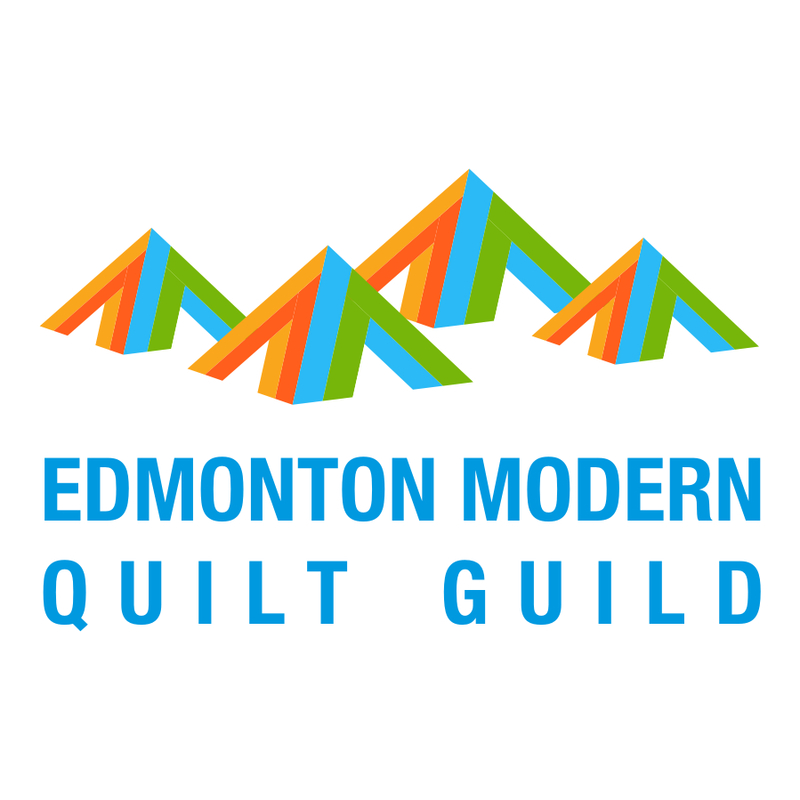 I've missed seeing all your quilting! Glad to see some here on your blog and it is gorgeous (also - I want to steal the green gloves on your other post....). Happy New Year. I love love love the colors. What a fun quilt in every way.